Mystere™ by Cirque du Soleil®, buy now and save! 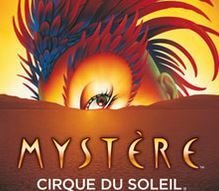 Mystere by Cirque du Soleil is showing at the Mystere Theatre at the Treasure Island Hotel and Casino, Las Vegas. No matter which Cirque du Soleil show You choose, You will not be disappointed, so choose the one that best fits Your location. Mystere is at one of the best locations, center strip. Mystere features the strength of the Alexis Brother’s hand maneuvers. The hand strength is so hard to believe, You wonder if this is illusions or live action. You will also see the usual 50 foot jumps and falls and typical of Cirque du Soleil, You will miss more than You will see. Missing more than You will see is a strategy that is used so that four People can see a Cirque show and have four different experiences to talk about afterwards.